I still feel nostalgic for The Crew. It’s not that it was an excellent racing game—it wasn’t. Not by any means. The early hours were a grind, trying to get your car to handle like a car instead of a super-powered tractor, and even once you’d leveled up enough to drive halfway decent it still never felt as solid as a Need for Speed or a Forza game. But the map. That incredible, America-spanning map with its theme park representations of San Francisco, Los Angeles, Detroit, New York City, Miami, and everything in between. In my review back in 2014 I referred to The Crew as “stellar virtual tourism,” and “a tribute to American car culture.” It was both. It was a game about discovery, a history of America told through landmarks both natural and man-made. It was Simon & Garfunkel’s “America” crackling through a racing-striped Charger. It was a mediocre “game” maybe, but still something special. Special enough that, despite giving it a middling score, I still remember my experience with The Crew better than many games from 2014 I actually did enjoy. A sequel? Yeah, I’m interested. Not that I have much to go on, yet. Ubisoft’s E3 demo was either maddening or tantalizing, depending on how charitable I’m feeling. I spent 20 or 30 minutes with The Crew 2 ($60 preorder on Amazon), finished four or five races, but at no point was I allowed to just pick a direction and drive. And that’s a shame. 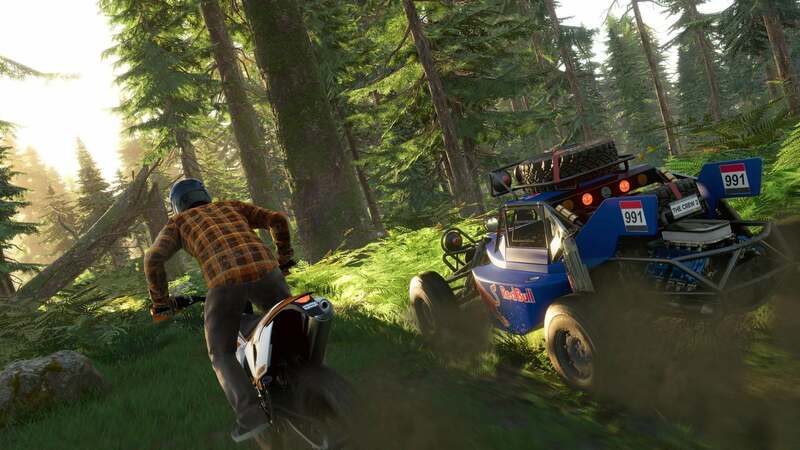 Like the original, I fully expect The Crew 2’s map to be its strongest feature. I got to tool around Manhattan in a sports car for a bit, and a few races took place in the Vermont/New Hampshire/Maine area, but I would’ve honestly preferred just driving down a dark highway through Colorado towards Las Vegas or whatever. Just something...scenic. 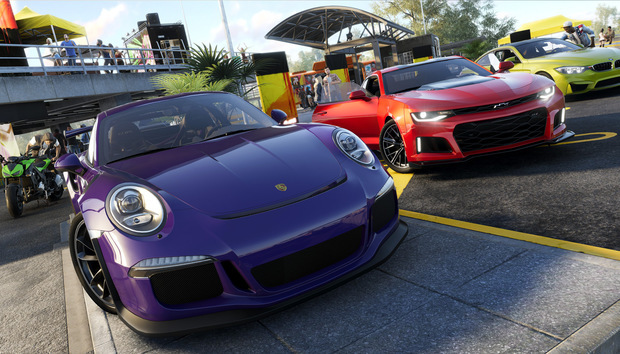 It also remains to be seen how much The Crew 2’s America has been reworked. I did confirm with Ubisoft that some bits have been tweaked, and looking at the map in the menu I think the cities look bigger here and there. More fleshed out. The foundation is the same though, as far as I know. The developer talking me through the demo seemed adamant the map wasn’t rebuilt from scratch. Take from that what you will. Changes most likely had to be made to accommodate The Crew 2’s new features—namely, boats and planes. Whereas The Crew had you simply riding around in your car for hours on end, The Crew 2 adds skies and waterways to your available excursions. It’s smooth, too. Using presumably the same tech from last year’s winter sports game Steep, The Crew 2 allows you to change your mode of transit on the fly by just pushing in the right stick. You can be driving down the streets of Manhattan, then a second later be flying through the same street in a prop plane, the car fading out as the plane comes into being. The same goes for boats, though here the game will have to teleport you to the nearest waterway—not quite as seamless. Still, it’s an interesting way to get players hopping between different options. I can already imagine races that take you down the entire East or West Coast, then hopping into a car to cross the U.S. before hopping into a boat again to finish the journey. Speaking of races, they seem more dynamic. Our demo opened with a race that involved all three classes of transportation, with aquatic, aerial, and driving legs all in a row. That was interesting enough, but the driving also seems more arcade-y, reminding me of the Cruis’n series at times. The race literally involved ramping a car up onto rooftops in New York City, which is definitely not something I saw in The Crew. Driving seemed improved, from what I played—all the cars I used were lively, fun. I was told the leveling system has been reworked so that cars can actually handle differently based on model, not just on the gear equipped. That seems like an important step forward, though again we’ll have to wait until hours into a full review before we get a clearer idea. Boating and flying could be fine-tuned though—the latter, especially. Boats are decent, with surprising depth. You can adjust where the weight of the boat sits for instance, sacrificing control for a bit more speed. Other boats can also throw you off course, their wake trails causing you to misjudge a turn or suddenly veer in an unintended direction. It feels floaty, a bit like simply driving on ice, but clearly some thought’s been put into the fundamentals. Planes are really simplistic though. You can do barrel rolls and all that, but it feels a bit like flying a plane in Grand Theft Auto or something—there’s no weight to it, no real sense of the plane as a vehicle. You just point the plane in the direction you want and go. I wouldn’t really mind if The Crew 2 really were the “American Tourism Simulator” I intend to play it as, but when the planes are supposed to also be used in skill-based racing events it seems a bit weird how casually they’re flown here. It’s something for Ubisoft to work on before the game’s release next year. It doesn’t really matter to me though. I can point out allThe Crew’s flaws, and while I fully expect this sequel to be a better racing game than the original I still don’t expect it to be a great racing game. I don’t see it dethroning Forza Horizon anytime soon, a game that often feels almost as big in scope but more precise, more controlled, more sculpted. But The Crew offered something no other game ever had—a chance to see America, or at least to see the highlights. A chance to catch the space shuttle sitting in Cape Canaveral, pink in the early morning sun. A chance to wind through the Rockies at a hundred miles an hour, crest the top and see Vegas in the distance. A chance to drive from New York to Los Angeles in 25 minutes and never hit traffic. Those are the experiences I’m looking forward to reliving in a sequel, this time maybe with an airboat chase through the Everglades or barrel rolls over the Space Needle. That’s the magic The Crew is best at, and it has nothing to do with the actual vehicles. It’s a weird niche to fill, but they’ve filled it, and it’s a niche I’ve really come to enjoy.